Tana Toraja is one area in Indonesia that is still thick with the feel of custom. Tana Toraja is located approximately 300 kilometers from the city of Makassar , South Sulawesi . 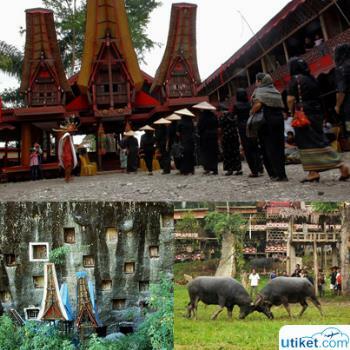 Tana Toraja is one of the prime tourist area owned by South Sulawesi Province . Each resident offspring of Toraja tribe still upholds the cultural heritage and customs of their ancestors to the present . Various ceremonies held each year in this area has a special attraction for every tourist who visit , including foreign tourists . One of the famous traditional ceremony in Tana Toraja is Rambu Solo , which is a typical ceremonial funeral procession from Tana Toraja . Tana Toraja community believes that a person who has died, the death is considered imperfect when Rambu Solo traditional ceremony has not yet been held . So before the ceremony held , the deceased person will be treated like a person who is sick or in a weakened condition . They will be respected and treated like they are still alive , as laid in bed when going to sleep , provide the dead food and drink to talk to him about everyday life . Costs required to organize this ceremony is not small , it is not surprising that the funeral could be held for months until many years after the person died . Basically Rambu Solo ceremonial procession divides into two , namely Prosesi Pemakaman (the funeral procession) , also known by the name of Rante and Pertunjukan Seni (Performing Arts) . Both these processions are not held separately but complementary whole . For Funeral Procession or Rante, it’s usually held in special field located in the middle of a custom home Tongkonan with the first order of events is body wrapping process called as Ma'Tudan Mebalun , the second process is decorating coffins using gold and silver threads or called as Ma'Roto , the third is the procession of taking the body to a funeral place called as Ma'Popengkalo Alang , and the last is Ma'Palao / Ma'Pasonglo the processes of taking the body from Tongkonan custom house complex towards the cemetery ( Lakkian ) . The first event of Procession of Performing Arts is the procession of taking buffalo to be sacrificed , followed by several of local music performances such as Pa'Pompan , Pa'DaliDali and Unnosong and indigenous dances like Pa'Badong , Pa'Dondi , Pa'Randing , Pa. ' Katia , Pa'Papanggan , Passailo and Pa'Silaga Tedong . Then headed to buffalo fight event known as Mapasilaga Tedong . The last is the ritual of slaughtering the buffalo as sacrificial animals . Art show held not only serves to enliven the funeral process , but also as a form of respect and prayer for the dead . Usually the number of buffalo slaughtered becomes the measurement of level and degree of wealth of the deceased when they were alive . Rambu Solo traditional ceremony for the Tana Toraja community is considered as an important and obligatory. This ceremony reflects the lives of Tana Toraja people who like to work together , have a family and as a gesture of respect and devotion to the person who has died .